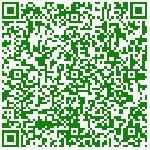 The selection of best sampling point is always a matter of individual decision in any type of sampling process. Stack monitoring is part of Air Quality monitoring in Environmental monitoring. The sampling point in Stack Monitoring should be far from any disturbance, bends, baffles etc. To select best sampling point it advised that it should be at a distance 5-10 diameters for downstream and 3-5 diameters from upstream disturbance. Opening in stack for sampling is absent in majority of stacks. Therefore there has be a provision in stack for sampling points. The size of sampling point can be made in range of 7-10 cm in diameter. Also that extension can be closed during non-sampling period. In order to sample to become representative, it should be collected from various points across the stack. This method is called as Isokinetic Stack Sampling. This is necessary because velocity and concentration of gases will be different across cross section of the stack. So traverse points have to be located to achieve this while selecting Sampling point in Stack monitoring. Generally traverse points are selected from cross section of the stack perpendicular to the gas flow is divided into specified number of equal area. 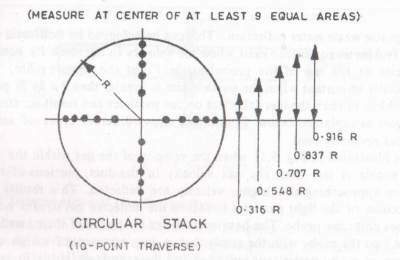 In circular stack, traverse points are located at the centre of equal annular across two perpendicular diameters. 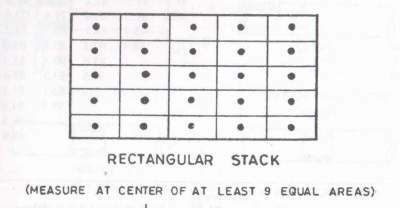 In case of rectangular stacks, the area divided into 12 to 25 equal areas and centres are fixed for each square. The traverse should be carried out at least on nine squares on at least three lines. The efficiency of sampling depends on conditions at which sample was taken. Collected sample should be representative of entire source. This can be achieved by isokinetic stack sampling. Isokinetic Condition exist when velocity in stack is equal to the velocity at the top of probe nozzle. This is very important when particle size is greater than 3 µ as because of inertia it can result in wrong sample. When velocity of the gas in sampling nozzle is less than gas velocity in duct, part of gas stream are deflected. It can be resulted in heavier particles enter into probe resulting non-representative high concentration of heavy particles, hence erroneous weight. Conversely, Because of deflection if the velocity in probe is higher than that of gas stream is being sampled with excessive amount of lighter particles entering the probe. Hence high concentration of lighter particles and sample weight is on lower side. It is necessary to select sampling or traverse point in stack monitoring as per calculations and with correct methods, so that errors while collecting sample can be minimized. what are the benefits of stack emission testing? Let us know your Thoughts or views on this.